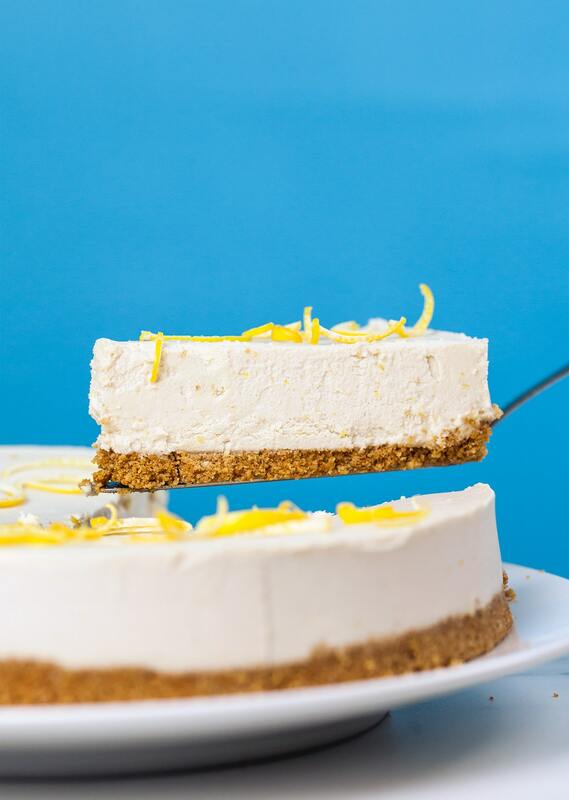 Creamy, light and zesty, this vegan no-bake lemon cheesecake is a staple in the So Vegan household! 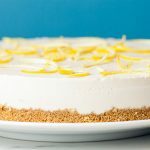 This recipe was actually featured in the BBC Good Food magazine last year, but we’ve only just got around to sharing it with you guys because we’ve been so busy working on our cookbook (sorry!). Place the 2 tins of coconut milk in the fridge to set the cream. This can take between an hour and three hours depending on much fat is in the coconut milk. Process the vegan biscuits and coconut oil in a food processor until fine. Then transfer to a cake tin and press down with a glass for an even and firm base. Leave the cake tin to one side. Remove the coconut tins from the fridge and scoop out the coconut cream that has settled on the top. Transfer the coconut cream to a blender and discard the coconut water or use it in another recipe. Add the cashews, maple syrup, juice of 4 lemons, zest of 4 lemons, vanilla extract, and salt to the blender, and blend until smooth. You may need to do this in two batches if your blender is too small to contain all the ingredients. Pour the cheesecake mix on top of the biscuit base and tap the tin to level out the mixture. Place the cheesecake in the freezer for two hours so it becomes nice and firm. Meanwhile prepare the lemon decoration by peeling the remaining lemon, then slicing the peel into 1 mm thick slices. 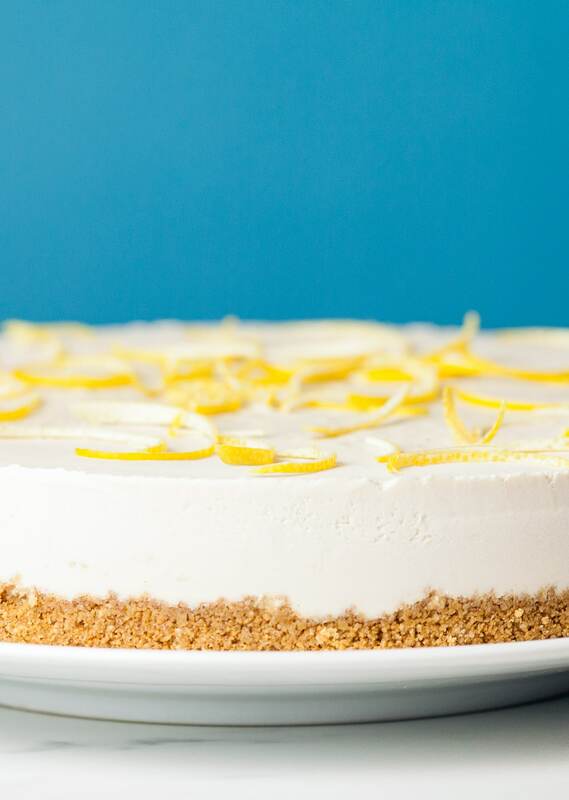 Gently remove the cheesecake from the tin and place on a serving plate. Then sprinkle the slices of lemon peel on top. This looks amazing and SO yummy. How much grams/cups goes into the cake if you use coconut cream out of a tin? 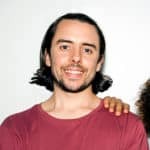 bonjour ,j”aimerai bien recevoir les recettes en français ? 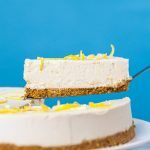 Si vous me donnez votre mail, je vous envoie cette recette de cheesecake en français. Testée : délicieux vraiment ! For us on the other side of the pond, would you also add the conversion from metric to English? The recipies all sound so yummy — thanks in advance. What is the size of the cake?” I.E. the circumference? I also would like to know how much coconut cream is expected to be obtained from the 2 tins as it is possible to buy tinned coconut cream anyway. i would also like to know this, as we have cans of pure coconut cream here in the states. thx! what kind of cookies (biscuits) do you use (out of curiosity)? I need to make this and leave it for 4 days before it’s eaten. After freezing it for 2 hours, should I leave it it in freezer or put it in the fridge? I’m afraid it will get hard/icy in the freezer or super soft in the fridge.